The owner of a new puppy has an almost blank canvas. A dog learns from the moment it is born and all of a puppy’s experiences determine how it will be as an older dog. For this reason, dogs that are raised in puppy mills, or farms, and sold in pet shops can arrive at their new homes with fear or socialization issues. Often a new owner cannot understand why his puppy appears frightened or nervous. This insecure reaction from a puppy will affect everything new that it experiences. The puppy mill dog may not have seen outside of a kennel or passed a concrete wall at any point in its short life. 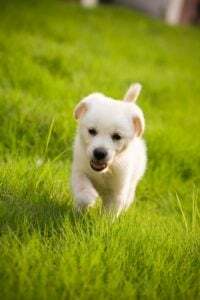 So when researching the best place to get a puppy from, it is advisable to find a reputable breeder or good rescue center. Both will have worked hard to ensure the puppy and its litter-mates are as socialized as possible. They will also be able to give you valuable information such as how to train a puppy to come and suitable feeding schedules. A puppy with few fear issues is generally much easier to train on recall than an untrained adult dog. When learning how to train a puppy to come, you are not dealing with the unhelpful behaviors already learned by an older dog. To train a puppy to come when you call it is imperative to use positive reinforcement and reward. If you offer tiny slivers of meat to a young puppy he will follow you. Firstly, you are his security and secondly you taste nice. By learning how to train a puppy to come when your dog is very young you will avoid the awkward unleashing of an older dog. I have heard owners in the past say that their puppy is too young to go off the leash. I don’t actually believe that a puppy is ever too young to be off leash. By keeping their dog restrained until adolescence any owner can easily set himself up for a failed recall. This is because they are adding the new excitement of free running to the dogs already challenging teenage behavior stage. The sooner the better is my opinion when practicing how to train a puppy to come back when called. Here are some tips based in positive learning for letting your puppy off the leash for the first time. Take treats, small and delicious food reward will motivate your puppy to stay near you. Walk quickly away from the puppy yet still offer plenty of reward, this will keep you interesting. Change direction regularly, this will encourage your puppy to focus on you. 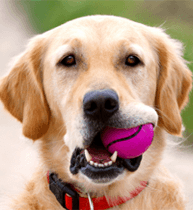 Use a toy if your puppy likes them, something squeaky that you can use to keep his attention. Utilize your voice, a higher pitched voice than usual will keep the attention of your puppy. Have a helper hold your puppy and go a few steps away then call him, give him a treat when he gets to you. Call your puppy between two people both rewarding his return with a treat and plenty of praise. Walking in new and unfamiliar areas will increase your puppy’s need to feel secure and as you are his security he will stick close to you. This need will assist greatly in learning how to train your puppy to come. Keep in mind that it is important to speak to your veterinarian about vaccinations and associated risks before introducing your dog to the outside world. Areas of high canine population and high disease risk the vet may encourage full vaccination before outdoor walking. In this case it is important to do what you can in the house and garden. When researching how to train a puppy to come when called it is important to be very careful. There is a lot of uneducated dog training advice on both the internet and in some actual dog training establishments. Look for advice that only promotes positive dog training and reward based reinforcement techniques. Be careful of any advice mentioning dominance, punishment or aversion. None of these methods are fair to dogs or proven to work long term. Remember if it makes you uncomfortable and your puppy unhappy do not do it. Puppy and all dog training should be positive, fun, reward based and progressive.